By now, everyone knows the unthinkable happened. And forget about someone else twitching that causes a false start. Prior to 2003, the rule was a disqualification after 2 false starts. You could have several false starts before the actual race started, which meant delays for both the paid attendance as well as TV viewers. Then the IAAF changed the rule copying the Swimming rule. First false start charged to the field, then the next false start gets you disqualified. But in 2010, the rule was changed again copying the NCAA rules. One false start, and then you hit the showers. I am not a great starter so I personally like this rule. I have a better suggestion. Why not have one set of rules for the prelims and a different one for the final? Bring back the 2003-2009 rule ONLY for the finals? This gives at least a saving grace in case of a false start? Rugby 7 playing time rules are different for the prelims and finals. 2 x 7 minutes halves (90 sec half time) for the prelims, 2 x 10 min halves (2 min half time) for the final game. Most of the time, it’s the athlete’s fault, but sometimes the fault can be blamed to the starter who holds the athletes longer than 1.89 seconds in the SET position. Any hold longer than 2 seconds is too long in my opinion, and if that is the case, the starter should simply say “stand up” and restart the race. Watch the IAAF make a rule change prior to the London 2012 Olympics. 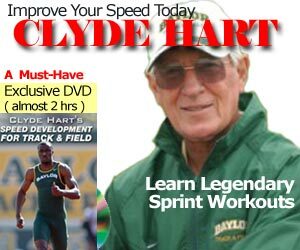 You would figure we have evolved a lot over the past 20 years with faster tracks, better spikes, and better training & supplements? But as I warned everyone in the 4×100 meter relays, “Anything Goes”. When you show up at the starting line, you have to believe you can win or medal, no matter who is running. Irving Berlin would be so proud. This was not a grand moment for track and field. The powers that be are going to be back peddling in the board rooms during their next meeting with the event hosts, promoters, financial backers and sponsors. Lurking in the background is the problem with having only a few athletes recognized worldwide while the rest remain in obscurity. Certainly the organizers recognize that an important element of any athletic event is about entertainment. The rules and policies need to reflect that or there will be a decrease in the public’s interest which translates into a decrease in the investments and revenue needed to regenerate the cycle. Perhaps they may have tweaked the rules a bit tight in this case. The 100 meter event in itself has inherent weaknesses as compared to say the jumping events which usually allow 3 mistakes before one is disqualified. That would be obviously unfair and impractical for the elite sprinting event. Lastly, there was some question as to whether the false start was triggered by another competitor’s twitching or slight movement. In this day of video technology, there is no excuse to not be able to review such incidents especially from a static position that begins the 100m event as well as all cameras focused on the participants. Even an extra 15 minutes to allow for accurate assessments and decisions is not too much to ask of everyone in the stadium. Heck, they do it all the time at horse races. But then maybe thoroughbred horses might be more valuable than their human counterparts. I’ve never had an issue with the 2 false start rule. Where 1 false start results with the entire field being warned and the 2nd false no matter who you are ends up with your disqualification. Just my take. I havent heard any rumbling from Usain Bolt and in my opinion that is a great thing. He made a mistake and thats all it was and I believe he accepted it. Kudos Lightning! On a side note, with James winning the 400m I believe and hope that this years 4x400m will come down to the wire, the 400m had me on the edge of my seat….AT WORK, thank goodness its less than a minute or else I would’ve created a scene with my “ohhhhhs” and “ahhhhs”. LOL. Certainly agree, Jimson, that Usain was very honorable but it would have done justice to all sides if they still had your mentioned 2 false start rule in effect. I believe that taking into account what the fans of the sport would desire to see during the track and field should be strongly considered. That’s more likely what the sport and the organizers also envision but came up short this time. Yes. Team Grenada not to be taken lightly. Is Kirani James still running for the University of Alabama? heres something interesting i stumbled across, you might have already seen it,http://www.youtube.com/watch?v=ygn4585tLh8&feature=player_embedded#! The IAAF change the false start rule all the time, if its athletics current superstart that has fallen foul of it, its no reason to consider a change. As much as admire BOLT and can only imagine his anguish in getting DQ’d in the 100m, I was suprised to see his tantrum and childish arm flinging when Blake won; I thought if it wasn’t him that won, who else could he possible want to see win apart from his countryman and training partner? evidentally not. I wish Wallace spearman and tyson gay was on form then he wouldn’t be getting a 200m gold either this year. The rule now is great, you grow not being able to false start and are taught to react to the gun. But now that you are running on a world class level you get more than one chance…. I like the rule as it stands bc it is better that way and the way our youth are taught they can see it at work. TAKE $$$ out of the equation and lets get back to the basics, REACT TO THE GUN and do not try and guess when it is going to be fired. I am a college coach and I have coached many youth and high school athletes. This was a great lesson for them. @Anthony Wallace, the false start rule is great, but I think they should change the 0.100 reaction time to 0.080 (or even 0.060), as studies shave shown humans could actually react to this. Sure, it’s a very small percentage, but look at Caster Semenya or Oscar Pistorius.. they are a very small % of the world.